Director Jacques Tourneur didn’t make many movies and is largely forgotten today, but he has a cult following of which I am a part. He made horror films such as I Walked with a Zombie, film noirs such as Out of the Past and films that exist somewhere in between, such as 1957’s suspenseful and scary Curse of the Demon. The plot of the film pits hard-headed American psychologist Dr. John Holden (Dana Andrews) against sinister British cult leader Dr. Julian Karswell (a deliciously malevolent yet courtly Niall McGinnis), who claims to have magical powers. Holden is investigating the mysterious death of a colleague who, like himself, was trying to debunk Karswell’s claims. Karswell tells him calmly that his colleague was destroyed by the curse of the demon, and that a similar curse has been placed on Holden and will end his life in just a few days. Holden at first laughs this threat off, but then begins to experience a series of unnerving events that cause him (and the audience) to becoming increasingly scared that the curse of the demon is real. Handsome, broad shouldered Dana Andrews looked like he had decades of stardom ahead of him in the 1940s, but unfortunately he developed a serious alcohol problem that drove his career southward before he finally got into stable recovery around 1970. In some of his scenes here, he looks a little shaky and pale and one wonders if that is acting or not, but in either case, it works perfectly as Dr. Holden begins to unravel psychologically. Peggy Cummins, so unforgettable in Gun Crazy, is pretty bland here as Holden’s fellow investigator and love interest, so the real sparks come in the scenes between Andrews and McGinnis. Their debates about science versus superstition are among the highlights of this film (This photo is from my favorite such scene, which Tourneur brilliantly set at a children’s party in which Karswell is wearing a clownish magician’s costume). As you would expect for Tourneur, there are lots of noirish visual touches, including abundant shadows and deep focus shots of people walking alone down empty corridors and streets. It all works perfectly to maximize emotional tension in this classic chiller. N.B. This film is sometimes entitled “Night of the Demon” and sometimes “Curse of the Demon” depending on whether you’ve got hold of a US or UK print. In any event, the thing to ensure is that you have the full 95 minute version and not one of the chopped up shorter prints that are around. After the jump, I will discuss a dispute that arose during the making of this film and what it means for the interpretation of the story. SPOILER ALERT: Don’t read the material after the jump if you haven’t seen the movie. Tourneur was unhappy with how unambiguously the final version of the film makes clear that the demon was real. He wanted to show the demon either not at all or so quickly that the movie would not take a clear position on whether there was such a creature or whether it only existed in the minds of its victims (A conclusion echoed in Andrews’ final line in the film about how it’s better not to know whether there was such a creature). 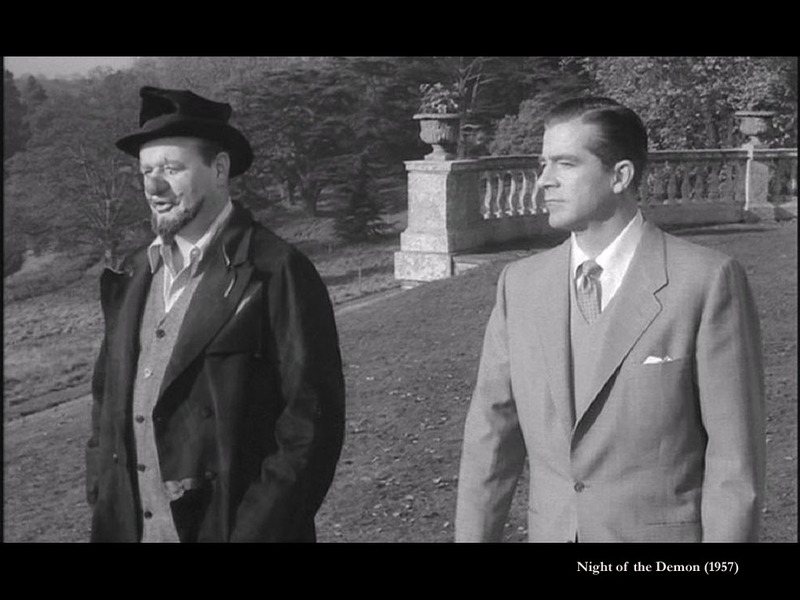 But Tourneur was overruled by the producers, who took control of the two demon scenes on the film. 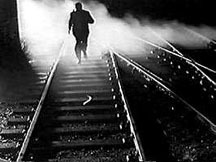 In the final scene, Tourneur had clearly set up the smoky, clacking train to be the cue that convinced Karswell that the demon was after him, and the (not bad for the time) demon effects are now superimposed on that. Note also in the first appearance of the demon, the demon is not necessary to the death that occurs, so again Tourneur had set up everything to keep the demon’s existence ambiguous. Whether it would have worked better Tourneur’s way is a matter for debate. I suspect it would have been a very good, hair-raising film either way. I intend to watch the movie so I haven’t read the spoiler. But I just wanted to alert RBC readers that both iTunes and amazon.com have for sale (or rent, in the case of iTunes) only what seems to be the chopped-up version: 83 minutes long, not 95. Addendum: Oh, the shame…On double-checking, I learned that I was partially wrong. Runes is spelled (as well as pronounced)that way in “Science Fiction Double Feature” from RHPS. But the rest, thankfully, is accurate. Just watched Curse of the Demon. It felt so much like an X-Files Monster of the Week episode that I’m left wondering how many times Chris Carter watched this film.